Sliced bananas layered in a graham cracker crust with a cream cheese - dream whip filling, blueberry pie filling and topped off with cool whip and fresh blueberries! The best part about this recipe is that is makes 2 pies! Good morning everyone. I wanted to apologize for not posting a Potluck Sunday post yesterday. I got caught up on a home project and time got away from me. So instead of having a potluck Sunday post, today I will be posting Potluck Monday. Feel free to link up in the same manner as we do on Sundays. 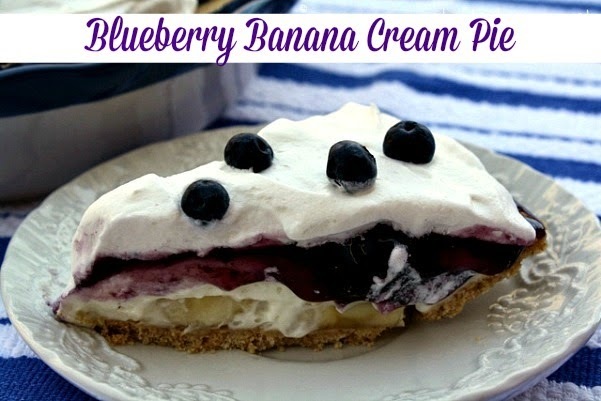 I've been wanting to share this recipe for Blueberry Banana Cream Pie for quite sometime now. This is my mother in laws recipe and one of my favorite pies. She always make Blueberry banana Cream Pies for just about every holiday. My mother in law Linda has been making this pie long before I became part of the Butler family 15 years ago. It was Thanksgiving when I got my first taste, and believe me it was love at first bite!!!! The best part about this recipe is that it makes two pies. One to share and one to keep for yourself. I do have to admit it's a bit hard parting with that second pie.The only way I have ever eaten this pie is with blueberry pie filling. But if blueberry isn't your thing then I think you could substitute any fruit pie filling. Let's get started and make some pie. Prepare the dream whip according to packet directions and set aside. Cream the sugar and the cream cheese together until creamy and smooth. 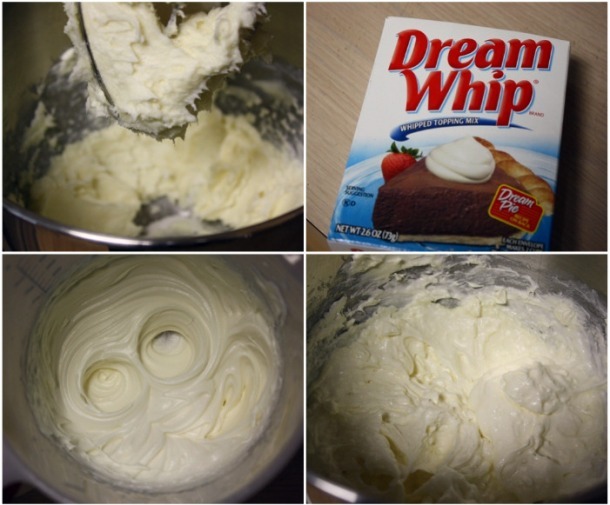 Add the prepared dream whip and mix until combined. 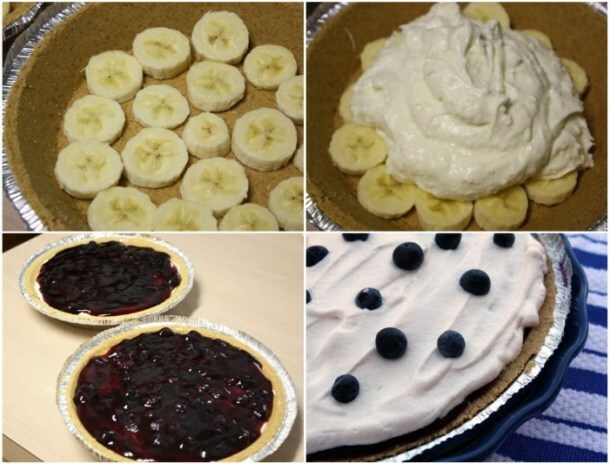 Slice one banana for each pie and layer on the bottom of each graham cracker crust. Add cream cheese mixture on top of the bananas and spread evenly covering the bananas. Spread the blueberry pie filling on top of the cream cheese mixture. Spread the cool whip over the pie filling and garnish with fresh blueberries. Chill at least 3 hours and serve. Heavenly is the only word that comes to mind when describing this pie. Enjoy. Prepare the dream whip according to packet directions and set aside. Cream the sugar and the cream cheese together until creamy and smooth. Add the prepared dream whip and mix until combined. Slice one banana for each pie and layer on the bottom of each graham cracker crust. Add cream cheese mixture on top of the bananas and spread evenly covering the bananas. Spread the blueberry pie filling on top of the cream cheese mixture. Spread the cool whip over the pie filling and garnish with fresh blueberries. Chill at least 3 hours and serve. Reading this post just made my stomach growl! It sounds so amazingly good. I'm always looking for new blueberry recipes - it's the one fruit my husband eats without complaining! Your welcome Jane. I was so excited to finally have a blueberry recipe to contribute! the country cook, this pie is so good. The combination of the bananas and blueberries is so tasty. Fingers crossed your hubby loves it. how weird -- i didn't even know banana and blueberry went together well. it sure does look good. I love blueberry and banana together! When I make blueberry pie, sometimes I use half the blueberries and add some chopped up bananas to fill it. People look at me funny, but it's so good! This looks like another way to enjoy them IN A PIE. I love pie. Thank you! Une belle tarte qui semble délicieuse. I can tell that this will be a "love at first bite" pie for me too!!! YUM! I love this combination but sadly my hubby doesn't... so I substituted strawberries for bananas and cherry pie filling for the blueberry pie filling and it was pretty tasty!!! Still wish that I could try your version... stinkin' hubby!!! We made this today. My two year old daughter helped! This pie is seriously amazing! So so delicious. Light airy creamy - love the texture and banana/blueberry/creamy flavors. Perfection! Thank you for sharing! This was my momma's favorite pie. For some reason it was called a "Papoose Pie". She would often make it with cherries. Either way, it brings back wonderful memories. Thank you for sharing!